A Statistical Study of Locus Online 's "Notable Books"
If you have ever browsed the infinite shelves of books by Robert Jordan, you have surely asked yourself when the tide of fantasy will completely overwhelm the bookstores. And if you are a fan of Jordan or Le Guin, you have probably worried about the invasion of the space opera, represented by Peter F. Hamilton, Alastair Reynolds, and Iain M. Banks. Is there a basis for such fears? What is going on with the demography of the subgenres? Do we get more and more sequels every year, recycling the same old ideas? Is interest in the speculative fiction genre as a whole increasing or decreasing? Here, I will attempt to answer these and similar questions as objectively as possible. The Locus Online "Notable Books" database was chosen as the basis of this study, mostly because of the larger number of entries relative to other book review periodicals, and because of the lack of genre pre-selection. The listings contain a cover image and short book description, and may include links to author or publisher sites, and quotes from other reviews. However, the reviews omit reprints, which undoubtedly affect the market of new titles. The oldest available "notable" book summaries on the Locus website date from May 1998. The current selection criteria are very liberal—any published book that is available for sale will be included in this listing if a copy is mailed to Locus Online . However, the criteria may have changed in the past. This liberalism is a further argument that makes these listings the next best source of information after the complete statistics of all publications, a daunting task considering all the small presses and self-publishing operations that have gained momentum over the last few years. Furthermore, the Locus Online listings are expected to have a considerable effect on the market because of the popularity of the magazine and the website, making them an even better representation of the books that are most likely to reach the readers and to have an impact on them. Eighteen book categories were defined. The first twelve categories concern three subgenres—science fiction (hard SF, space opera, alternative history, various punks, social SF), fantasy, and horror—each subdivided into four publication types: standalone novels; sequels (including prequels, and parallel novels); collections; and anthologies. The first novel from a series is counted as a standalone book. The omnibus publication of two and more novels from the same series is counted as a sequel. A certain number of books defied classification. Typically, these are eclectic subgenre collections and anthologies. The results are summarized in Table 1 and plotted in Figure 1. I have selected three one-year periods within the last decade. Two of them start in midyear because of missing listings on the web site. Fantasy is winning more and more attention with time. Figure 2 demonstrates that this subgenre dominates the listings in 2007. Horror publications, poetry, and nonfiction seem to follow the same trend, while the non-speculative-fiction category is in retreat, perhaps hinting that the "genre ghetto" is withdrawing even further into itself, i.e. the speculative fiction writers tend to stay exclusively inside the genre walls. The proportion of collections and anthologies seems to be reduced, limiting the flux of short fiction to readers. How significant are these trends? Having only three measurements, we cannot provide rigorous answers, except for the major categories that are populated with sufficient numbers of books. A linear fit to the points in Figure 1 gives us the rate of increase of the number of books included in Locus Online reviews, averaged over the entire time period. For example, for SF it is 11.5 ± 0.9 books per year. In other words, the number of the reviewed SF books has increased on average by 11-12 every year between 1998 and 2007. The rate for fantasy is 26.9 ± 7.7; for horror 3.1 ± 0.7; and for other books 4.1 ± 1.0 (all in units of books per year). The uncertainty margins are the formal fitting errors. 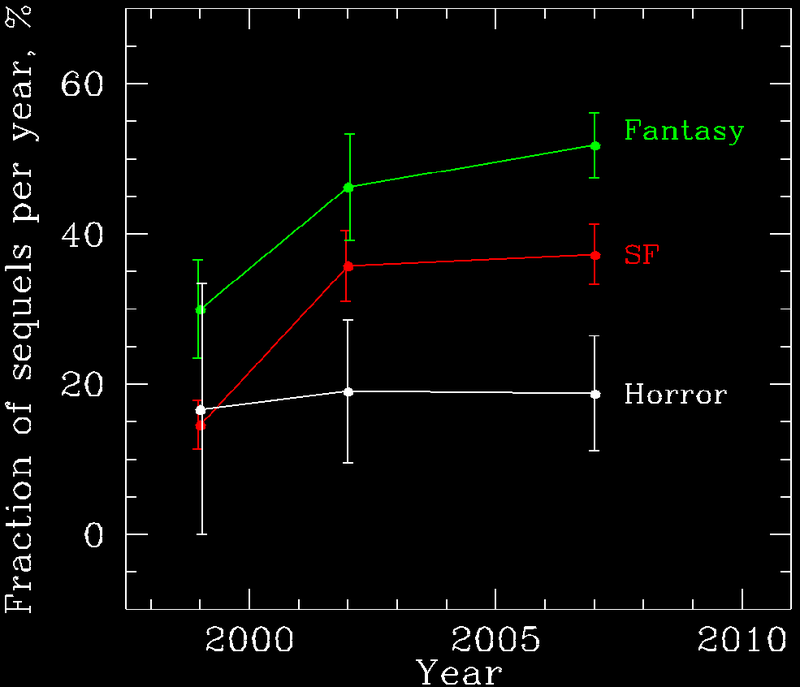 The larger uncertainty in fantasy's growth rate reflects a systematic error due to the fact that this category has inflated only recently, and the linear model is not an adequate representation of its behaviour. Fantasy's lead over SF in terms of growth rate is a margin of about 15 books per year. The probability of this happening by chance is extremely small—about 1-in-1010. Therefore, we are likely facing a statistically significant nonrandom trend here. It appears that the invasion of the sequels is truly happening. However, this result is not as obvious as the previous one—Figure 3 suggests that the proportion of sequels included in Locus Online reviews remains nearly constant after the 2001-2002 period. In other words, the changes are well within the expected random variations, shown in the plot with error bars. However, even today most of the published sequels still do not make it into the reviews. The sequels that are reviewed, are on average encountered later and later in their series. For example, there are only two fourth or fifth volumes in 1998/9, eleven in 2001/2, and forty-one in 2007, corresponding to a nearly 20-fold increase, much bigger than the 2.4-fold increase of the total number of the listed books. Big and small publishers alike are present in Locus Online reviews, allowing for the promotion of niche and experimental literature. Here is an incomplete book count by publisher: Tor—210 books, Harper—92, Ace—69, Ballantine Del Rey—67, Bantam—64, DAW—55, Baen—46, Roc—39, Gollancz (UK)—34, Avon—30, Eos—28, Warner—24, Simon & Schuster—21, St. Martin's/Thomas Dunne Books—20, Penguin—16, Harcourt—12, Juno—11, SFBC—11, Doubleday—10, Macmillan—9, Orbit—9, Knopf—8, Tachyon—8, Scholastic—7, Bloomsbury—6, Solaris—6, Small Beer Press—6, Putnam—6, Pocket Books—4, Hodder & Stoughton (UK)—3, 1st Books Library—2. A few disclaimers. First of all, these are the statistics of the listed books, not of all published books. There is inevitable subjectivity in the genre classification. The trends presented here may be a product of certain selection effects, i.e. if the publishers used to consider it unnecessary to submit sequels for listing ten years ago but gradually evolved towards more aggressive policies in the shrinking and increasingly adverse market conditions, etc. The sample is dominated by U.S. publishers, with rare incursions by U.K., Canadian, and Australian ones, usually for authors who have already gained popularity in the U.S. The reader can find a detailed explanation of the statistical analysis tools used here in the comprehensive book Data Reduction and Error Analysis for Physical Sciences , by Philip R. Bevington. More popular explanations appear in Wikipedia. This study is not trying to judge the tendencies but to simply infer them. The final word is with the reader, who votes for a book with his or her buck and time. Number of books per year reviewed by Locus Online , for each of the eighteen categories described in the text. The last column gives the total number of books in each category, for all considered periods. Total numbers for SF, fantasy, and horror are also given (rows marked with "1-4," "5-8," and "9-12," respectively). 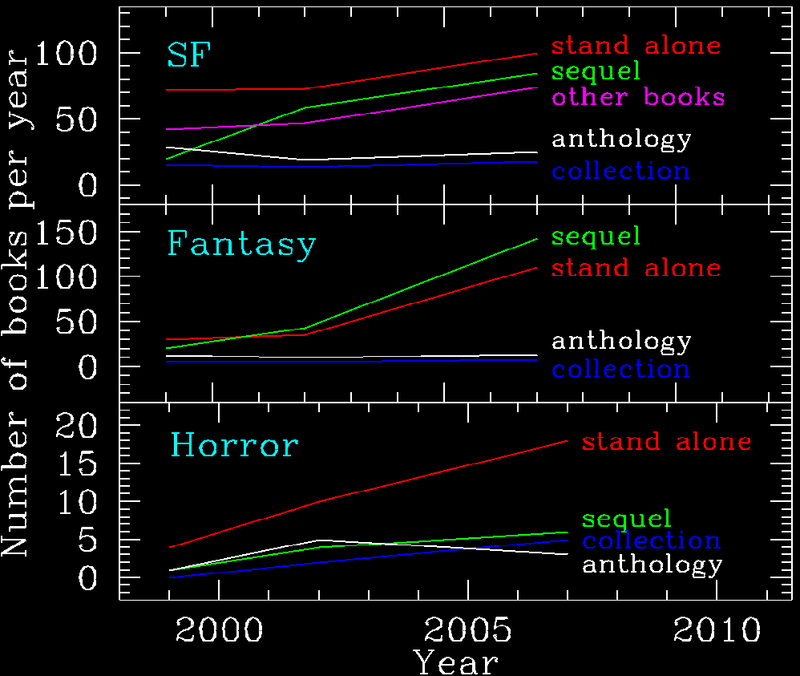 Evolution of standalone novels, sequels, anthologies, and collections for SF (top panel), fantasy (middle panel), and horror (bottom panel). The evolution of the total number of books that do not fall into any of these categories is also shown (top panel) for comparison. Note: The scale of the vertical axis differs among panels. Evolution of the number of books reviewed by Locus Online by genre: SF, fantasy, horror, and books outside these categories (marked as "others"). The error bars show the so-called ±1-sigma standard deviations that define the confidence interval within which a randomly distributed number will fall with a probability of approximately 68 percent. The dotted lines are linear fits to the data. 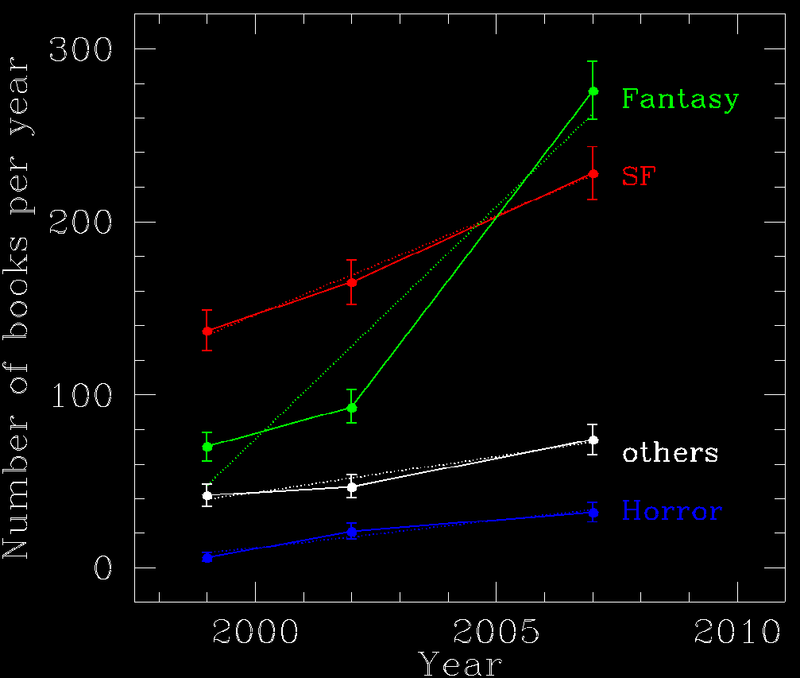 Proportion of sequels per year reviewed by Locus Online by genre: SF, fantasy, and horror. The error bars have the same meaning as in Figure 2, and they were offset along the X-axis for clarity (so that the bars for different categories do not visually overlap). For more information, see Valentin's personal web page and his bilingual (English-Bulgarian) blog. Valentin was born in Bulgaria in 1967. He is a professional astronomer, working at the European Southern Observatory in Chile. Valentin has published in his native country a fantasy collection based on Bulgarian folklore, written with Kiril Dobrev in 2006. His first English language stories, "How I Saved the World" and "Unstable atmospheric circulation", appeared in 2009.